Shreveport native Cathey Graham Nickell was driving carpool in Houston when the idea for a children’s book dawned on her. Houston has an impressive art car tradition. There’s a three-day parade and a museum dedicated to cars that look like they’re in costume, perhaps tricked out as a hippopotamus barreling down the road. 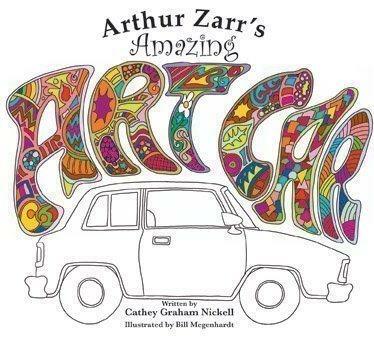 These art cars formed the basis for Nickell’s new picture book. Nickell’s character Arthur Zarr is a quiet, ordinary man. One day, he tinkers with the outside of his car, giving it a little personality. Eventually, neighbors and strangers join him in this creative process. He gathers up an alphabet worth of found objects and neighborly donations to attach to his car – gluing, taping or tying them on – beginning with an acorn for the letter "A." “First, he puts the acorn on the car and it’s really fun because he glues it as if it were a hood ornament, like a Mercedes or a Jaguar. He glues the acorn right on the front,” Nickell said. Nickell moved to Houston 18 years ago where she says she always snaps a picture when she spots an amazing art car on the road. Her Shreveport book signing is set for Saturday, Dec. 5, at Toy Fair in Pierremont Mall, 4801 Line Avenue, from 2 p.m. to 4 p.m.
Nickell collaborated with Houston graphic illustrator Bill Megenhardt on the book project.